Description: Tons of power have just left their NB train, and head to the shops. Description: BNSF GP38-2 2157 is trailing a eastbound light power move at Westmont. Notice there is a engine that doesnt quite belong on this train. Description: Two GP's lead a welded rail train into the St' Paul yard. Description: BNSF 2157 and the CHI425 returns to Barstow after a mrning on the Barstow Sub. Description: My first train picture. Description: In the late afternoon sunlight a GP38 and a GP39E kick cars in Saint Cloud. Description: NB BNSF local heads into the yards. Description: Three EMDs with the power in the right order, old school leading the new school. odd that the oldest units are the best looking and cleanest. Description: The poor economic conditions continue to show their affects, as a new units are put into storage. I caught the 2157 with three other units on a train back in December. Sad to those ex CB&Q units going, but they've had a VERY long service life. 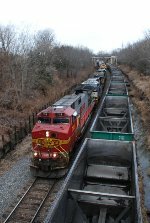 Description: BNSF 708 leads a eastbound freight past an empty coal in the siding in Bucklin. Would anybody have an idea where these five GP38's are going? Description: BNSF 708 east at Stae Highway W in Lingo.